The Department of Homeland Security’s Office of Cyber and Infrastructure Analysis (DHS/OCIA) produces Infrastructure Risk Assessments to provide an assessment of emerging risks to critical infrastructure. This report addresses how the adoption of and increased reliance on smart technologies may create or increase risks for Smart Cities. This report focuses on the Transportation Systems Sector, the Electricity Subsector within the Energy Sector, and the Water and Wastewater Systems Sector. This interconnectedness of devices introduces cyber-physical technologies that connect cyber systems to physical systems, thereby removing the barrier between the cyber and physical worlds. Some cyber-physical systems are integrated at the design stage unlike more traditional legacy systems; a full-fledged cyber-physical system is typically designed as a network of interacting elements with physical input and output instead of as standalone devices. Smart City, in everyday use, is inclusive of terms such as ‘digital city’ or ‘connected cities’. Cyber-physical innovations feature prominently in Smart Cities, particularly as cyber-physical technologies are increasingly added to existing infrastructure and built into newly constructed infrastructure. Removing the cyber-physical barriers in an urban environment presents a host of opportunities for increased efficiencies and greater convenience, but the greater connectivity also expands the potential attack surface for malicious actors. In addition to physical incidents creating physical consequences, exploited cyber vulnerabilities can result in physical consequences, as well. The vulnerabilities and attack classes (such as distributed denial of service, malware, and phishing attacks) to most logical technologies such as computers and servers have been researched over the decades and years and are well understood by security researchers. Although the specifics of the attacks and potential consequences can vary with each type of attack the basic structures and general mitigations for these attacks are known. The same can be said of the vulnerabilities and mitigation factors for physical infrastructure. However, with the introduction of Smart Cities and cyber-physical innovations the vulnerabilities, resulting mitigating factors, and potential consequences for these new technologies are still unclear. As these new cyber-physical devices are introduced to the World the vulnerabilities, risks, threats, and consequences will be better understood. 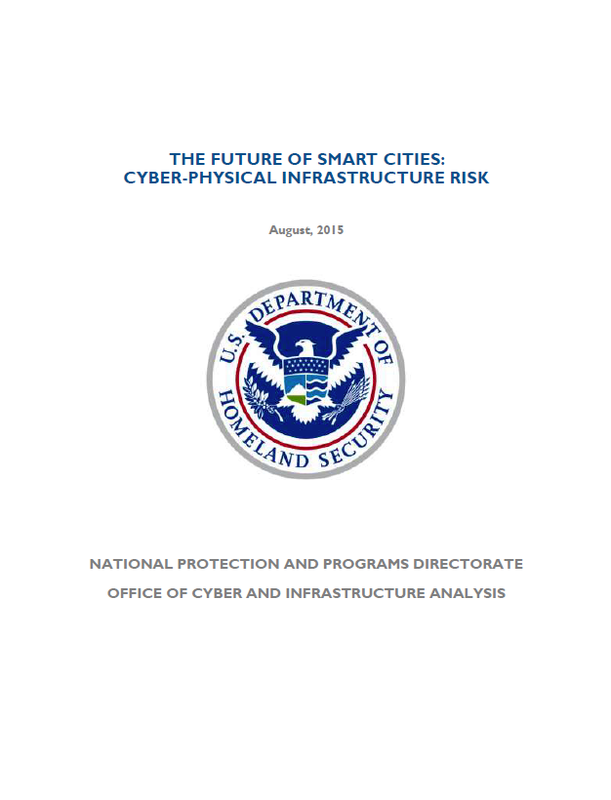 This report summarizes the insights from a technology-informed futures analysis—including a critical look at potential future vulnerabilities as a result of these cyber-physical infrastructure systems become pervasive in Smart Cities. The goal is to help Federal, State and local analysts and planners incorporate anticipatory thinking into Smart City design and continued critical infrastructure protection efforts relating to this new technology. The analysis focuses on specific cyber-physical technologies that represent key aspects of the future of Smart City infrastructure (Table 1). Autonomous vehicle technology enables automobiles to understand the environments in which they operate and execute safe and efficient commands based on this understanding. Autonomous vehicles can assume decision-making and operational tasks, enabling drivers to become passengers, entirely disengaged from the demands of driving. Autonomous vehicles can steer, select optimal speeds, avoid obstacles, choose efficient routes, park themselves, and warn passengers of imminent danger. The majority of autonomous vehicles in development use a deliberative architecture, meaning they are capable of making decisions entirely based on onboard technology—though many are capable of also incorporating external inputs when beneficial. To gather the data necessary for operation, autonomous vehicles use a variety of sensors. Light detection and ranging (LIDAR) technology uses light pulses to identify lane and road markings and boundaries. Global positioning system (GPS) devices gather specific geographic data to inform route selection and other location-based decision-making, often in combination with onboard tachometers, altimeters, and gyroscopes. Video cameras track other vehicles and pedestrians while capturing information on traffic lights and road signs. Radar sensors similarly track other vehicles. Ultrasonic sensors support parking by capturing data on objects in close proximity to autonomous vehicles, including curbs and other cars. A central onboard computer processes inputs from these sensors and issues commands to a car’s steering, acceleration, braking, and signaling systems. Advanced Metering Infrastructure (AMI) is a system designed to bring new transparency and efficiency to energy consumption in smart grids. Smart meters—part of the AMI—measure, store, and transmit energy usage data and voltage data for residences and commercial buildings within a smart grid. Unlike traditional energy meters, some smart meters within AMI systems employ two-way communication technology, often using wireless connections to send and receive data from utilities and system operators. Dispatch and management centers can also physically control the meters, with the ability to connect or disconnect power remotely. In addition to smart meters, AMI consists of a server to gather, store, and disseminate smart meter data and a communication system to connect the various components. These in-home smart meter connected appliances help to facilitate demand response programs and other dynamic energy-consumption programs. The majority of these in-home devices utilize a cloud infrastructure for connecting the appliance to the meters.88 By incorporating new connectivity and networking, as well as increased insight and control over energy-consumption patterns, AMI allows utilities to monitor, track, and influence energy usage across millions of smart meters. Although the data collected by smart meters is invaluable in helping utilities increase efficiency and manage power consumption, it also holds value for individual consumers. Specifically, when utilities share real-time usage information with customers, consumers can make energy-consumption decisions based on pricing and otherwise improve their energy usage. As a result, many utilities will introduce built-in connection points, or customer gateways, that will allow customers to access and review their smart meter information.